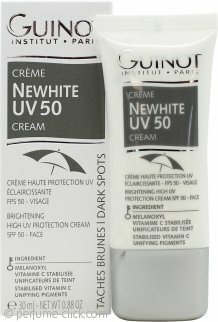 Newhite by Guinot is an exclusive and innovative collection of brightening products. It’s used to improve localised pigmentation marks caused by sun damage and it suits all skin types; it also helps with unbalanced melanin production generated by hormones. - Vitamin C, which lightens the epidermis, boosts collagen production working as an antioxidant and anti free radicals. - Melanoxyl, a complex derived from white cabbage, which helps slowing down the melanin production in order to reduce pigmentation. Bid goodbye to skin pigmentation problems and say hello to lighter skin choosing Newhite skincare line. The collection includes cleansing lotions, cleansers, serums, cleansing oils, day and night creams and face masks.